Molly Maid of Palm Springs and The Desert — We’re Maid for This! The Molly Maid Motto is; “Relax, It’s Done!” Doesn’t that just say it all?! You deserve this. This is not a guilty pleasure, it is just simply a pleasure. They know clean. Our cleaning crews arrive on time and in uniform with everything they need to clean your home. In most cases the same team comes every time. Additionally, homeowners can take comfort knowing all of our maids receive a thorough background check and are fully insured. Keys and security codes are treated with the utmost respect. Rest assured, you can trust your biggest investment with these quality professionals. Owners Anna and Mike Margolis tend to every detail to ensure your experience is exceptional. They customize each job assuring your quality of home life is better because they were there! The details of what they do in each room is to the highest standards including baseboards, under cushions, as well as what you might expect. 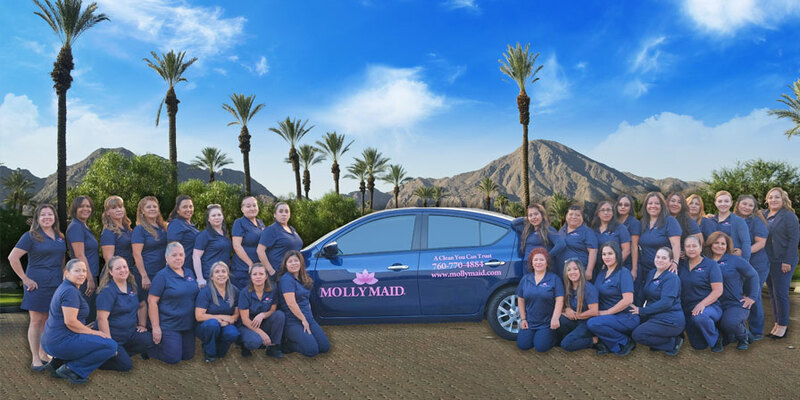 Whether you live in a large house or modest apartment, alone or with five messy children, whether you need weekly cleans or a single deep clean for the Holidays - Molly Maid has a flexible cleaning plan for your busy schedule and specific house cleaning needs. Unexpected guests? They can come as fast as 24 hours’ notice. It is worth it to get a fee quote for this affordable service. You take your car to a professional - don’t trust your home to anything less. They know clean. Leave the details to them.